Sugar Cookies….For My Brothers Anniversary! Well these beautiful biscuits were a bit of rush in the end, but worked out really well. I have started baking gifts for people, because I think it can feel more personal, very cheesy, but a ‘made with love’ feel. 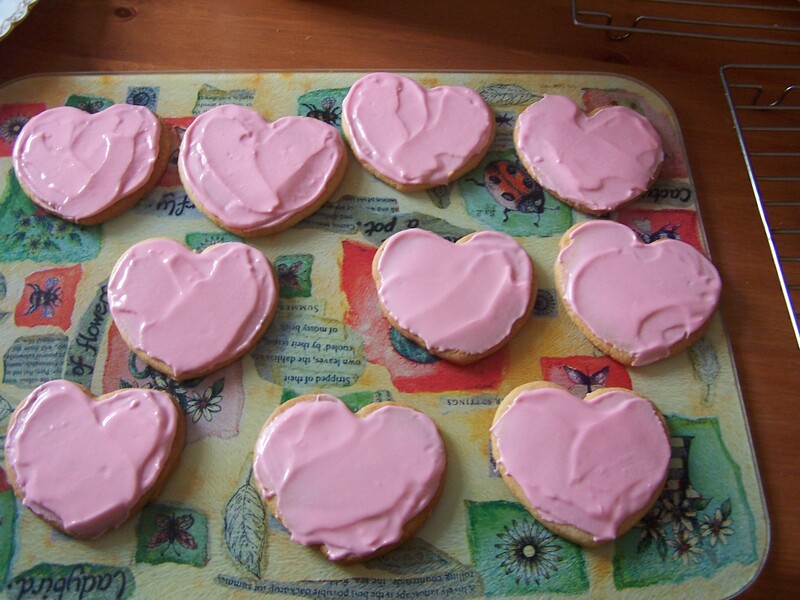 So it was their wedding anniversary this week, and going with the love theme, I made them 10 heart shaped sugar cookies, that I decorated with a pink royal icing, and packaged in tissue paper in a decorative tin for them. And they really liked them, so, RESULT!! for me. The recipe for the sugar cookies I found here: http://www.joyofbaking.com/SugarCookies.html The recipe made loads of biscuits, so not only did we make the heart shaped ones, I made some Thomas the Tank Engine ones, some cow ones, and with all the left overs, I made a big mincemeat filled sugar cookie pie thing, which my husband assures me was delicious. I have lots of baking planned for the coming week, including apple curd, date fingers and lemon curd ice-cream cake, so here’s to a busy baking time!! Yes I was going for the ‘rustic’ look to my icing. Yummy Yummy! !